No, it’s not. You just need to get Creative! Got it? Drink up! Ahhhh. Isn’t that better? Need some flavor? Fruit! Veggies! Herbs! Not only are they naturally sweet, they also add vital nutrients to the water. Try cucumbers, lemon + lime + orange, strawberry + kiwi, fresh mint, blueberrry + raspberry, cranberries + mint, cucumber + lemon + lime, pomegranate + blueberry, or any combination of your favorites. Chop them, slice them, or mash them. Let them infuse the water for about 30 minutes. You can keep adding more water to the same fruit for about 48 hours, then use new ingredients to keep it fresh. You’ll be amazed how much you’ll enjoy staying hydrated. If you simply can’t live without your bubbles, get a water carbonating machine** By using plain water as a base, you control the quality of your beverage by choosing well, tap, or filtered water. Do the environment a favor here and don’t use bottled water. Then pour your fizzy water over your ingredients or throw them directly into the (reusable) bottle for on the go. 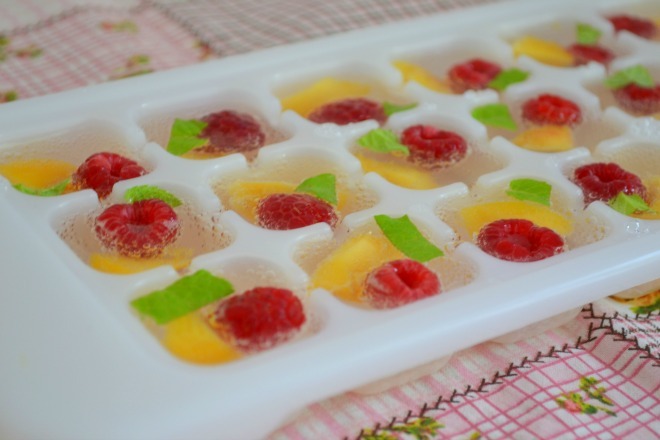 Toss some fruit or mint into an icecube tray and make delicious icecubes. As they chill your water, they’ll add flavor. My mom always used to use a bundt cake pan to make gorgeous ice full of colorful fruit for in a punchbowl. I hear this all the time as an excuse for excessive soda and sweetened beverage consuption. It isn’t that we are unaware of water’s benefits in hydrating, detoxifying, and energizing, but the marketing of beverages is big business (Coca-Cola’s 2010 advertising budget: $2.9 billion). There are fizzy, sugared or artificially sweetened, caffeinated option that are marketed to seem more interesting, despite the proven health risks they carry including diabetes, bone calcium depletion/osteoporosis, tooth decay and discoloration, hormone balance disruption, obesity, and cancer- and we drink them because advertising works, not because they are good for us. The beverage industry rakes in 60 BILLION dollars in soft drink sales annually. This means, each year, people spend $191.83 per man, woman, and child in America* on sodas and sports drinks. According to Static Brain, the average male in the 12- to 19-year age group drinks 868 cans of soda every year! Assuming they mean the standard 12 oz can, that’s 81.375 Gallons of unhealthy chemicals, sugars, and toxins, each. We don’t need sports drinks either. Our diets are laden with sodium and “enriched” foods, providing more than enough electrolyte. Even someone eating a balanced, 100% vegan diet is not going to need electrolyte supplementation. So, now you know. Set down that curvy little bottle and go get some good ol’ H2Oooooohhhh! **If you can hold a wrench, make one yourself (this handy fellow made one for $163.94 that will make thousands of liters.) Sodastream have several home models from $79.95 to $199.99. Carbon cartridge refills are about $30-50 and make 60-130 liters of carbonated water, depending on refill size. I frequently, if not daily, see the results of prolonged poor posture on the health and happiness on my clients- back pain, neck pain, chronic headaches, sore hips, vericose veins, swollen feet, digestive distress, poor sleep, and even symptoms like depression and anxiety. When you stand or sit with ideal posture, your spine is aligned and uncompressed, your nerves fire freely, your organs have space to do what they need to do, your circulations is uninhibited, and your musculature can support your body with a minimum of effort. 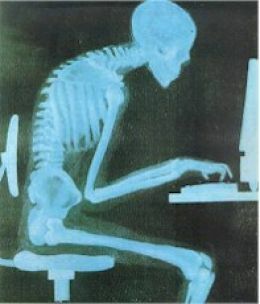 Ideally, we would all have perfect posture all day and even in our sleep. Here are a few tips for improving your posture and reducing your risk of adverse health affects. Visit a licensed chiropractor to have any imbalances in your skeletal system corrected. Have scoliosis, kyphosis, or lordosis diagnosed and treated. This will allow healing to begin and reduce the chance of injuring yourself as you move forward. You’ll feel better, I promise. Wear proper footwear! Athletic shoes, no matter how pricy or fashionable, need to be right for YOU to do you any good. They typically fall into three categories- motion control, stability, or cushioned. Consult a trained footwear professional to have your feet evaluated and properly fitted. For a preview of what you’ll need take this test. Even with proper footwear, some people will require orthotics or inserts to get them just right. There’s no shame in this. See a professional for these, since it would be a huge waste of money to buy the wrong kind at a drug store and hurt yourself. Another note on shoes: Heels are terrible on your body (seriously, throw them away forever!) Even a small rise is detrimental. There is not a single part of your posture they don’t ruin. Not to mention the bunions, heel spurs, plantar fasciitis, blisters, and other foot problems that can cause you to limp, making things even worse. 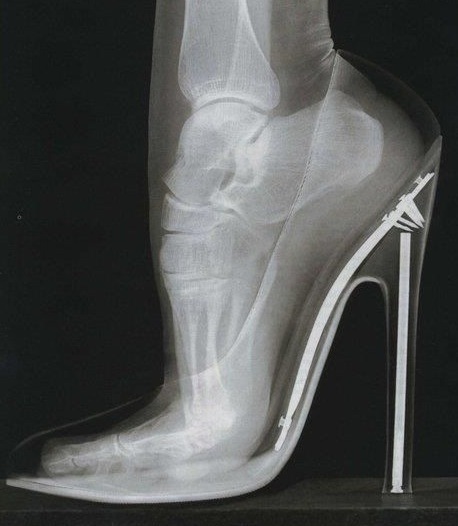 I see people with terribly painful foot problems and near-crippling posture problems caused by years of wearing heels. Just say no as much as humanly possible. Exercise regularly to tone and strengthen all your muscle groups, paying special attention to weak or imbalanced areas. Your core needs vigilance to stay strong and flexible. Work antagonistic (opposite push-pull) muscles in the same workout. Consult a chiropractor, personal trainer, or physical therapist for specific exercises that will help the most in correcting and supporting your posture. Now that you’ve exercised, S T R E T C H! You can stretch anywhere, with very simple movements. If you’re especially high-speed, join a yoga class. No, you don’t have to be flexible to go to yoga- you go to yoga to become flexible! Get up and move around at least once every 50 minutes or so to prevent stiffness and refresh the body and mind at work or at home. 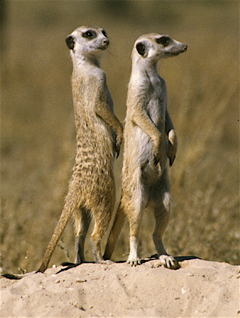 Stand or sit, but do it properly- for your health! Arrange your desk or workspace to be ergonomically ideal. 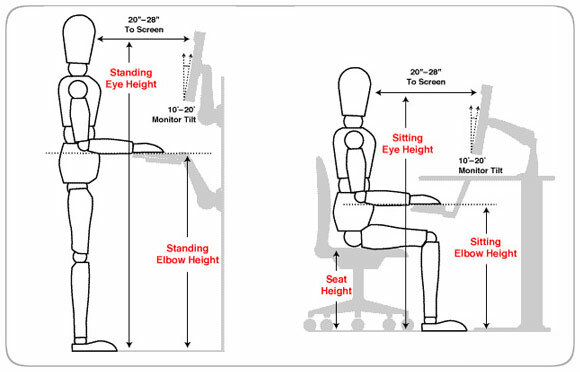 Your monitor/screen should be at eye level, your keyboard at elbow level, your hips and knees at approximately 90 degree angles, feet on the floor, back straight with good lumbar support from your chair. You shouldn’t be leaning forward or slouching back. It should feel comfortable. If you have to squint or lean into your screen, swallow your pride and get some good computer glasses or enlarge the font on the screen. Your neck and shoulders will thank you. Provide your body with the fuel it needs to stay upright. Eat FOOD, the kind you can recognize as something nature created, in moderate amounts throughout the day. If it has things in it you can’t pronounce, don’t eat it. It is amazingly cheap to eat well compared to the long-term results of diabetes, obesity, heart disease, high cholesterol, high blood pressure, and other diet-dependent conditions, which are thousands of times more costly than an organic apple a day. Hydrate, hydrate, hydrate! Without water you will wilt and your posture with suffer. Drink plenty of fresh water. Soda, diet soda, alcohol, and caffeinated or sugary beverages all dehydrate you. A rough guide is about 1/2 to 1 ounce of water for every pound of body weight (ie: 150 lb woman needs between 75 oz and 150 oz daily). This seems like a lot, but just 1% loss in hydration weakens you by 10%. 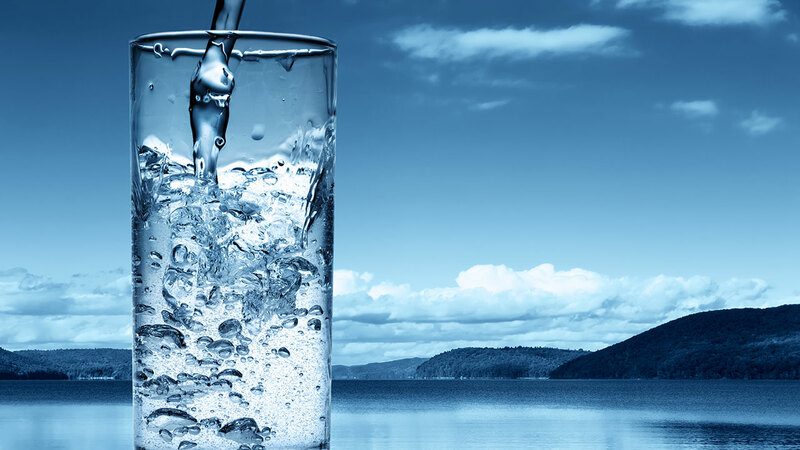 Not only will you feel better when hydrated, recent studies show that drinking enough water can dramatically lower your chances of having a heart attack. Cheers! Sleep well. Have a mattress that matches your body type, weight, and sleeping style. There are different pillows for back and side sleepers. Your pillow should support your neck and head in straight alignment with the rest of your body. Back sleepers should place a pillow under their knees and side sleepers should place a pillow between their legs to align the hips properly. If you are a stomach sleeper, please quit- it puts tremendous stress on your entire neck, reducing bloodflow to your brain while you sleep! Try sewing a tennis ball into the front shirt pocket of your PJ’s for a few weeks to encourage you to roll over. Bonus Tip: Get a massage. You’ve been adjusted, worked out, hydrated, fed, stretched, rested, and re-shoed. Now reward your soft tissues for all their hard work by relieving the muscle tension that contributes to pulling you back into bad habits. A professional massage will work wonders for alleviating the pain and stress that works against good posture. Ask for a therapist who is experienced in rebalancing the body after chronic overuse injuries. After all, that’s what bad posture is doing: creating long-term injuries to the spine, muscles, organs, and other tissues. Massage Therapists can analyze your posture and gait to create a massage that will lengthen tight muscles, unbind “stuck” tissue, and rebalance your entire body. Now go out there into the world and Stand Proud! SAN DIEGO – New research suggests that drinking sweetened beverages, especially diet drinks, is associated with an increased risk of depression in adults while drinking coffee was tied to a slightly lower risk. The study was released today and will be presented at the American Academy of Neurology’s 65th Annual Meeting in San Diego, March 16 to 23, 2013. “Sweetened beverages, coffee and tea are commonly consumed worldwide and have important physical—and may have important mental—health consequences,” said study author Honglei Chen, MD, PhD, with the National Institutes of Health in Research Triangle Park in North Carolina and a member of the American Academy of Neurology.